The change that Lisbon’s most central, and one of the oldest, neighbourhoods is heading towards has been known for some years now. Once old and degraded, neglected and forgotten, this neighbourhood has been the focus of attention in the recent years for good reasons; it’s opening itself for people, getting cleaner, rearranged and with a renewed burst. As part of this change, new artists and creators are finding Mouraria the spot to be. 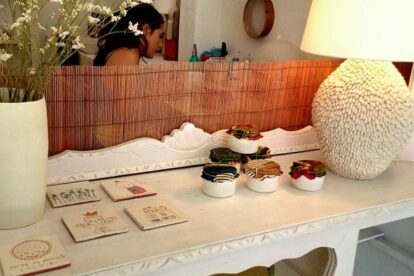 This is the case of Joana Simão, a pottery artist that recently opened her atelier in Largos dos Trigueiros, in the space previous occupied by Mãos à Dobra Origami Shop. The identity and genuineness of a place or people depend on its history and traditions, on its culture and on its artists also. That’s why I’m glad to see this atelier occupy this spot on Largo dos Trigueiros. The creations of Joana Simão are unique, handmade and original; they are made in front of you, not imported from some manufactory located elsewhere, and she even finds time to give some workshops. I find this endeavour has great value as it strengthens our identity. As a neighbour, I’m happy to receive her in the neighbourhood and more artists like her will also be welcome. Joana offers also courses on this art; check her website for more info. Plus it’s on Largo dos Trigueiros, one of the prettiest little squares of Lisbon that in itself is worth a visit.